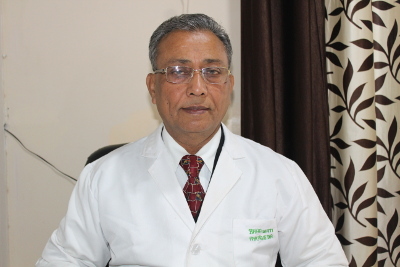 Awarded “Jugatram Vaidya Iastam Award” on 3rd March 2012 for Excellence in Teaching –Ayurveda, Indian Association for the study of Traditional Asian Medicine, Bharati Vidyapeeth Deemed University, Pune. 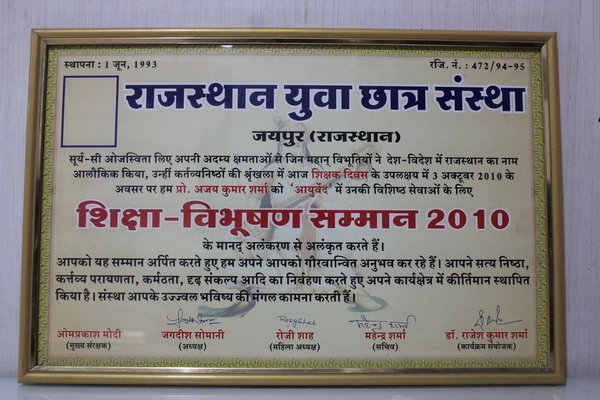 Recipient of “Shiksha-Vibhushana 2010” Award by Rajasthan Yuva Chaatra Sanstha, Jaipur on October 03, 2010. 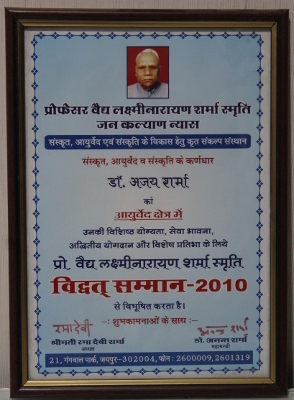 “Vidwata Sammana” for outstanding contribution in the field of Scientific Propagation of Ayurveda, by Prof. Vaidya Laxmi Narayan Sharma Samiti Jana-Kalyana Nyas, Jaipur on Nov. 16, 2010. 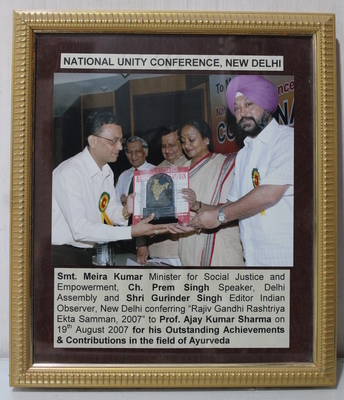 Recipient of “Swargiya Shri Shivnath Sharma Ayurved Shodha Puruskara” for the year 2007, for Outstanding Achievements & Contributions in the field of Ayurveda, sponsored by “Shri Gyana Kalyana Datavya Nyasa”, Managing trustee “Shri Murali Manohar Joshi” honourable Member of Parliament (Rajya Sabha), Chairman, Parliamentary Standing Committee on Commerce. 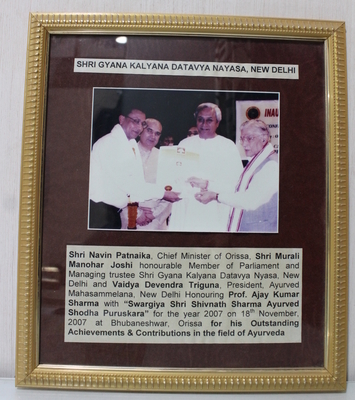 The honour was presented by “Shri Navin Patnaika, Chief Minister of Orissa on 18th November, 2007” at Bhubaneshwar. 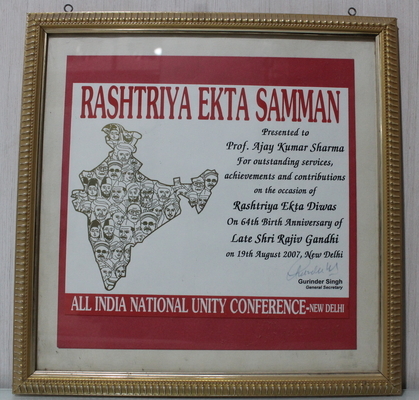 Recipient of “Rashtriya Ekta Samman” on the occasion of Rashtriya Ekta Diwas on 64th Birth Anniversary of Late Shri Rajiv Gandhi on 19th August 2007, New Delhi for Outstanding Achievements & Contributions in the field of Ayurveda. 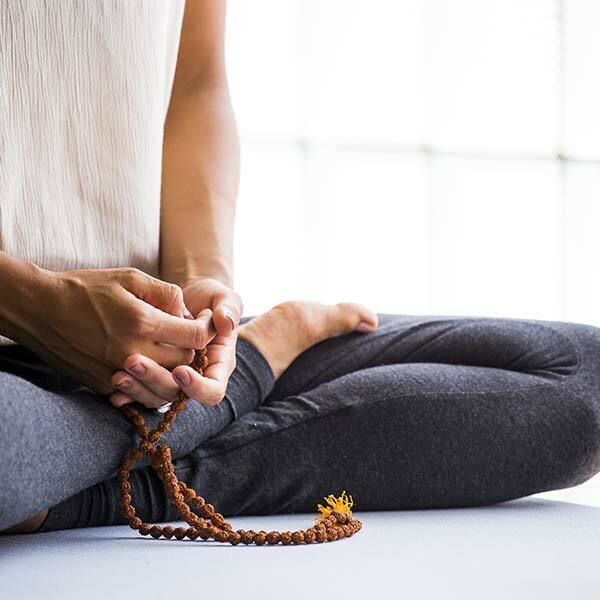 Received many awards from different Trusts & Social Groups of India as a token of Excellence for outstanding contributions in the field of Ayurveda & Panchakarma. 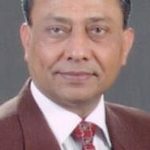 Received Best Paper Award in National Seminar on the Role of Pancha Karma in General Practice in Govt. 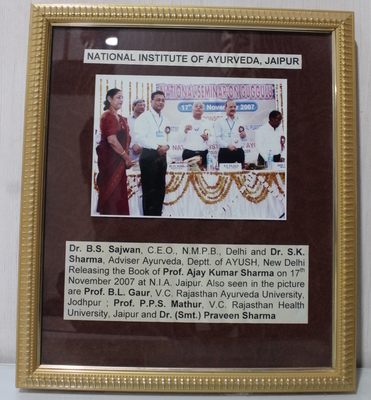 Ayurvedic College, Ujjain, M. P. in the year 2000. Topped the list of successful candidates in final year B.I.M.S. Exam (First Class First). Awarded special “Merit Certificate” for the same. Awarded full fee concession in final professional & half fee concession in second professional of BIMS on account of my good performance in the examinations. 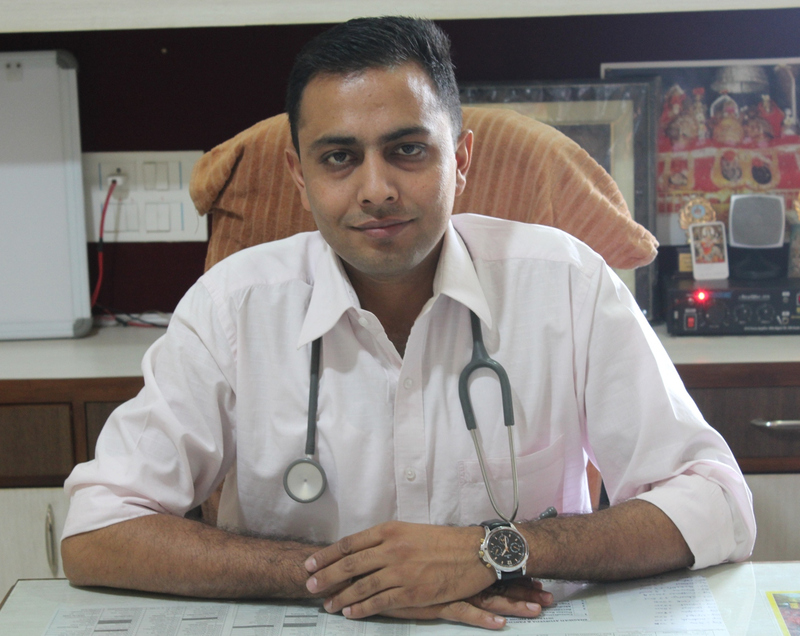 Dr. Ajay Kumar Sharma has been honoured with several Awards for his service to mankind. 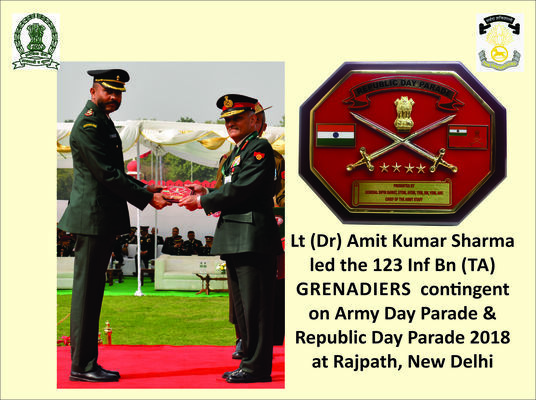 Detailed as Contingent Commander of Grenadiers Contingent on Army Day & Republic Day Parade and led my battalion on Jan 26, 2018 on Rajpath, New Delhi. 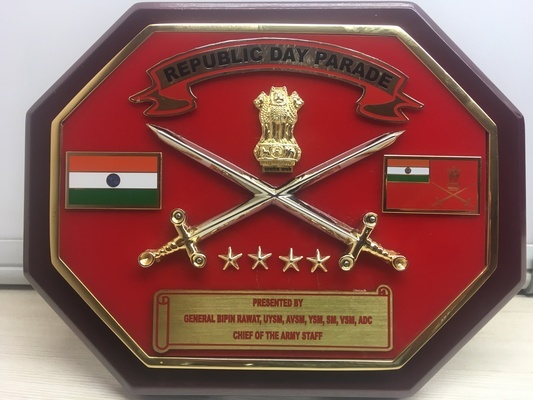 I was awarded General of Command – Commendation Card for the same on Aug 15, 2018. 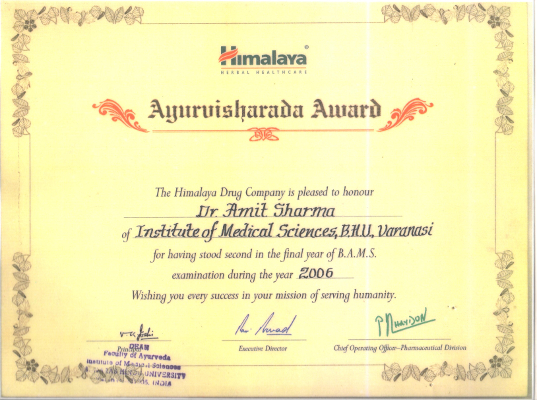 “AYURVISHARAD” by Himalaya Drug Company, for securing 2nd rank in Final Professional – BAMS at BHU in year 2007 along with a Merit Certificate, and a Cash Prize of Rs.7,500/- for the same. Distinction Marks in Charaka Samhita, Dravyaguna & Swasthavritta in Second Professional – BAMS at BHU in year 2005. Distinction Marks in Kayachikitsa, Shalakya Tantra & Charaka Samhita, in Final Third Professional – BAMS at BHU in year 2007 and was awarded Merit Certificates for the same. Distinction Marks in English in Class 12th, Year 2001. Merit Certificate for 100% Attendance & Punctuality in Std.10th, Yr 1999. Distinction Marks in Mathematics, Science & Social Sciences in Std. 10th, Yr 1999.